We are proud to announce that CosMediTour is now offering surgery with some of the leading Plastic and Reconstructive Surgeons in Thailand, at the newly established The World Medical Center in Bangkok! CosMediTour has entered into an exclusive alliance with the World Medical Center, offering our clients exceptional surgery and health care treatments in a luxury, JCI accredited medical center with standards that are recognised in Europe, America and Australia. WMC is also the first healthcare provider in Asia Pacific to successfully attain DNV GL hospital accreditation, which are a leading European provider of healthcare development towards Excellency. Thailand has long been recognised as the Medical hub of Asia, with over 2 Million foreign medical tourists arriving in the Kingdom each year. 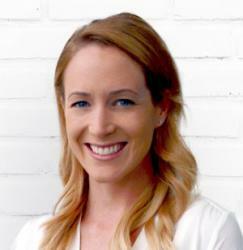 By obtaining such internationally recognised accreditations through its hospitals, it will remain at the forefront of the international healthcare sector. Stepping into The World Medical Center is like entering a 5 star Hotel, the facilities, structure and design are second to none, and the hospital staff treat patients like royalty. 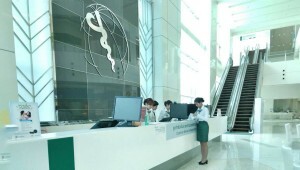 As Thailand’s premier new international hospital, The World Medical Center has the latest in innovative medical and communications technology in order to provide patients with the highest level of care and treatment available. The new Cosmetic Plastic Surgery Clinic is headed by the current President of the Society of Aesthetic Plastic Surgeons of Thailand and past President of the Society of Plastic and Reconstructive Surgeons of Thailand. The Cosmetic Plastic Surgery Clinic also hosts a number of Thailand’s elite Plastic and Reconstructive surgeons who are in high demand for their reputation for achieving remarkable surgery outcomes. All CosMediTour patients enjoy premium private accommodation at World Medical Centre – in the nation’s largest and most luxurious private hospital rooms. 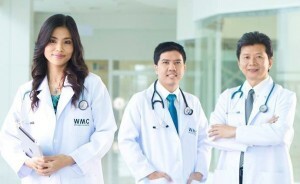 The World Medical Center is located in the new affluent area of northern Bangkok, easily accessible from the city center and Suvarnabhumi International Airport via the expressway system. Conveniently located walking distance from the Hospital, is the Central Plaza Chaengwattana, a large popular shopping mall in the Central group (See map here) If you are having surgery at the WMC, and have some down time between your consultation and surgery, this would be a great time to sample Thailand’s famous shopping! See more details about this Hospital and Surgeon’s CVs here.